It’s hard to say what the David Brent movie will be like. All we have, so far, is two posters and an image. It maybe a Mrs Brown’s Boys or a Pudsey the Dog? Will it do anything outside of the UK? Only time will tell. Twelve years ago, David Brent was a regional manager for a mid-level paper merchants. 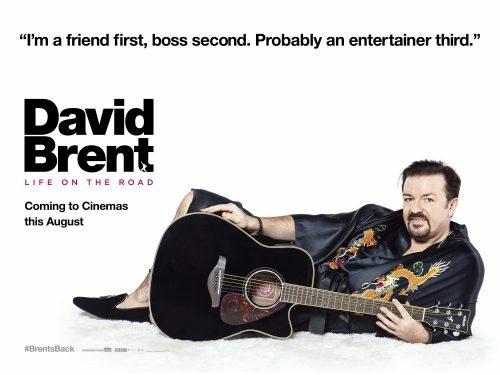 On 19 August 2016, get ready to see him on the big screen as he chases fame and fortune in DAVID BRENT: LIFE ON THE ROAD. Now working as a rep selling cleaning (and ladies personal hygiene) products up and down the country, Brent hasn’t given up his dream of becoming a rock star – or more specifically, singer/songwriter for fledgling rock band ‘Foregone Conclusion’. As he assembles a group of mercenary session musicians, a talented sidekick for street cred and an overpriced yet underwhelmed tour manager, he embarks upon a self-financed UK tour coming to a venue near every major city near you. Singing into UK cinemas on August 19,2016.